Add to the list another thing your iOS(s AAPL) can do for you: remind you to run your errands. A new app just hit the iOS App Store called Shopster that uses the geo-location services in the iPhone (or iPad or iPod touch) to not only keep track of where you frequently buy your groceries, but what you buy at which store. Then it can notify you when you’re near those locations and what you might possibly need to run in and grab. Shopster costs 99 cents and it’s iOS only right now. The developer is Quadion Technologies, a software company based in Buenos Aires. Previous iOS titles under its belt are games; Shopster is the first utility app. The design of the app is simple and cheerful. There are just a few screens: one for your items you’ve said you need to buy, one for items you’ve previously purchased, and another that shows you the stores you’ve frequently purchased a specific item at on a map. There’s not much to learn either. There’s a sliding bar on the right hand side that suggests quantities (so you don’t have to jump to the numbers keyboard on your iOS device). You select a quantity then start typing “sourdough bread” or whatever you need to buy. Once you’re at the store and you tap the check box to mark sourdough off your list, the app makes note of the geo-position of the store for that particular item. It doesn’t delete the item, but moves it to the “purchased” page for later. Just after playing with it for a bit, I can see a few ways this would come in handy. For example, if you really like the produce at your neighborhood market, but prefer to get your meats at the butcher across town, Shopster will notify you when you’re near those places of what you’ve noted you need to pick up. 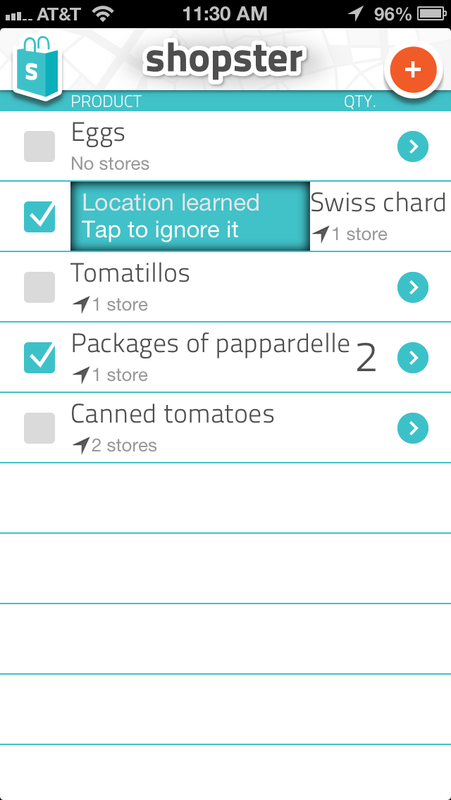 Another way to use it: if you hunted all over town in a panic for fenugreek seeds before a dinner party and then later can’t remember where you found it, if you marked it off your Shopster checklist at that store, the app will be able to tell you the name. It’s also just a simple way to keep a running grocery list. Once you check something off as purchased, it goes to the “past purchases” tab. Need to remind yourself to buy it again next week? Just uncheck the box and it goes back on your “to buy” list. Shopster is aimed at keeping lists of frequently bought items, so groceries is the natural application. But it doesn’t have to be used that way: if there are supplies or parts you often need to pick up locally, Shopster would work with that too. They’re not doing it yet, but it’s easy to see that one day Quadion could begin to incorporate coupons or deals from grocers or other retailers if they know what you shop for at their store. It could be similar to what ZipList offers with coupons, but with the added twist that Shopster actually knows when you’re in the store or nearby. $.99? Notepad is free and it’s included with the iPhone.